On Friday, I attended the CentOS Dojo at CERN, in Meyrin Switzerland. CentOS dojos are small(ish) gatherings of CentOS enthusiasts that happen all over the world. Each one has a different focus depending on where it is held and the people that plan and attend it. You can read more about dojos HERE. On Friday, we had roughly 60-70 people in attendance, in a great auditorium provided by CERN. We had 97 people registered, and 75% is pretty standard turnout for free-to-register events, so we were very pleased. There was an emphasis on large-scale computing, since that’s what CERN does. 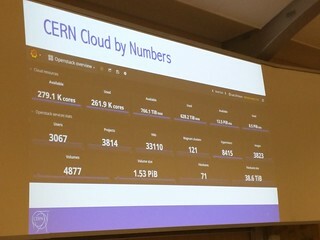 And the day started with an overview of the CERN cloud computing cluster. Every time I attend this talk (and I’ve seen it perhaps 6 times now) the numbers are bigger and more impressive. This time, they reported 279 thousands cores in their cluster. That’s a lot. And it’s all running RDO. This makes me insanely proud to be a small part of that endeavor. If you want to see your project distributed in the CentOS distro, a SIG is the way to make this happen. Drop by the centos-devel mailing list to propose a SIG or join an existing one. The entire day was recorded, so watch this space for the videos and slides from the various presentations. The CERN folks appeared very pleased with the day, and stated their intention to do the event again on an annual basis, if all works out. These things aren’t free to produce, of course (even though we strive to make them always free to attend) so if your organization is interested in sponsoring future dojos, please contact me. I’ll also be publishing a blog post over on seven.centos.org in the coming days about what’s involved in doing one of these events, in case you’d like to host one at your own facility..